The Young Adult titles listed below present adolescenthood in a variety of contexts and settings that courtroom n the deep south, a modern day high school, and a Russian forest. ‘Shout Out’ books highlight two recent non-fiction publications centred on the Holocaust. I’ve so enjoyed reading free verse novels by award-winning author, Alexander (Booked, Rebound, Solo) and was looking forward to reading his latest YA release, but I’m afraid I put the book down after reaching page 133. Noah has had a crush on Sam for many years and although she is part of his friendship circle, a romantic relationship doesn’t seem to be coming their way. Walt, Noah’s confident is determined to change all that, but I really wasn’t interested in how it unfolded and knowing that I had about 300 pages to go, I didn’t particularly care, even though I sort of wanted to find out about why American flags are being left around town. Looking forward to reading other Alexander books. I was fortunate enough to see the Broadway musical Dear Evan Hansen in New York and I feel it is a play that every adolescent should see. It is the story of a boy who feels invisible. Pretending that he was best friends with Connor Murphy, a troubled teenager who committed suicide, Evan must deal with the trap of lies he is building for himself, despite the huge success of a Social Media initiative where teenagers across the country are also trying to find a place to belong. I approached this novel with some hesitancy since I so admire the musical, but in the end this is a great read that helps readers get into the mind of a boy dealing with mental health issues. Usually a play or movie is based on a book, but in this case the book adapts the play’s characters and storyline and even without music sings an anthem about connectedness and the need ‘to be found’. TO KILL A MOCKINGBIRD by Harper Lee / Graphic adapted and illustrated by Fred Fordham for a graphic novel version. Fordham has faithfully used Harper Lee’s words and conversations and story events in this graphic novel version of the iconic story. Having recently seen theatre productions of the at the Stratford Festival and on Broadway, I decided to spend time with this book, which still resonates for today’s generation. And will continue to be taught and taught in schools. In the year following 9/11, Shirin, a Muslim girl, is caught in the tribulations of being a teenager. Her race, her religion and her hijab force her to withdraw from the degrading comments and taunts that are part of her schoolday experiences. A love of breakdancing and a growing friendship (and first love) with a white boy changes Shirin’s life as she learns to let her guard down and come to terms with the struggles of belonging and the impact of prejudice. A fierce and honest read, relevant to the lives of adolescents like, or unlike Shirin. Olga Stephenson, dear teacher-librarian at my school handed this novel over to me forty-one years ago when my father passed away and before Gary Paulsen and Jerry Spinelli, I would say Robert Newton Peck was a favourite author. I decided to re-read this novel that I so long ago enjoyed. Don’t know why I connect to Peck’s story of a young Shaker Boy and the relationships he has with his family, neighbours and his own pet pig named Pinky, but I was still impressed reading about the teachings of Pecks’ father and father and son’s faithful dedication to taking care of the farm. I wept at novel’s end just as I did four decades ago. Shaun Tan, author of The Arrival, Lost & Found and Tales from Outer Suburbia must have some pretty wild dreams. His surreal paintings are always staggering and in this collection they overpower Tan’s strange stories about animals, real and fantasized such as crocodiles trapped in a high rise building, a monstrous shark, a rhino on a freeway, and frogs who were once members of the business board. What an imagination! What a talent! As with any short story collection, I liked some (‘Parrot’ ‘Lungfish’), more than others (‘Bears’). In this contemporary retelling of Baba Yaga folklore, Jane Yolen, in free verse style, presents a story of the iconic Russian fairy tale witch in novel that is at times dark, dream-like, sad and sophisticated. 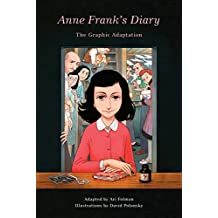 I approached this publication with some trepidation, believing that iconic The Diary of Anne Frank be left untouched, because it is iconic and because it’s authenticity shouldn’t really be tampered with. More people are familiar with Nazi Germany with this book, more than any other. This version was an extremely powerful read, faithful to the beloved book. The visual images are often quite staggering, extending the feelings, moods and questions of a young adolescent girl. Expressions and gestures and musings of the characters along with the cramped attic quarter setting and war-torn landscapes are artfully captured. The graphic adds further interpretation and clarity to Anne’s narrative. Portions of the original text are retained throughout. 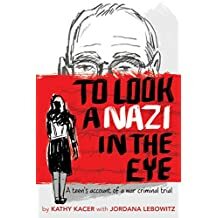 In 2015, nineteen-year old Jordana Lebowitz attended the war criminal trial of Oskar Groening, “‘The bookkeper of Auschwitz” who was complicit in the deaths of more than 300 000 Jews. Kacer outlines Groening’s testimony as well as shares the voices and hard stories of Holocaust survivors who came to testify against them. As witness to the events, Jordana helps readers understand why it is important to remember history and move forward for social justice causes.